The Kubota Retractable Safety Knife is perfect for the home, office or shop. Designed with durable plastic, replaceable trapezoidal blade and anti-slip grip. Ideal box cutter for mailing, storage and moving. The ANVIL 9 mm Snap Knife with a plastic housing is durable and is designed to resist the elements. 9 mm blade features 13 cutting points. The fully retractable blades lock in any position for safe cutting. When the blade gets dull, simply break off a segment for a sharp new edge. The Milwaukee<sup></sup> Duct Knife is designed for optimal edge retention and durability. The stainless steel blade is engineered to stay sharper up to 5X longer when cutting flexible duct and insulation. The double edge blade allows for a wide range of applications. A full metal tang provides durability for tough cuts. Includes a durable sheath for easy carry and storage. OLFAs L-2 heavy duty cutter is built to withstand even the toughest cutting jobs, including cardboard, wallpaper, leather and rope. This ergonomically designed polycarbonate handle offers an anti-slip rubber insert to provide a comfortable grip while the heavy-gauge stainless steel blade channel ensures safety during use and maximizes the durability of your cutter. This cutter features OLFAs unique ratchet wheel blade locking mechanism for positive locking which means you can lock the blade in place according to the thickness of the materials being cut. Common uses of this cutter include industrial cutting applications, do-it-yourself projects, contractor jobs and hobby and craft applications. 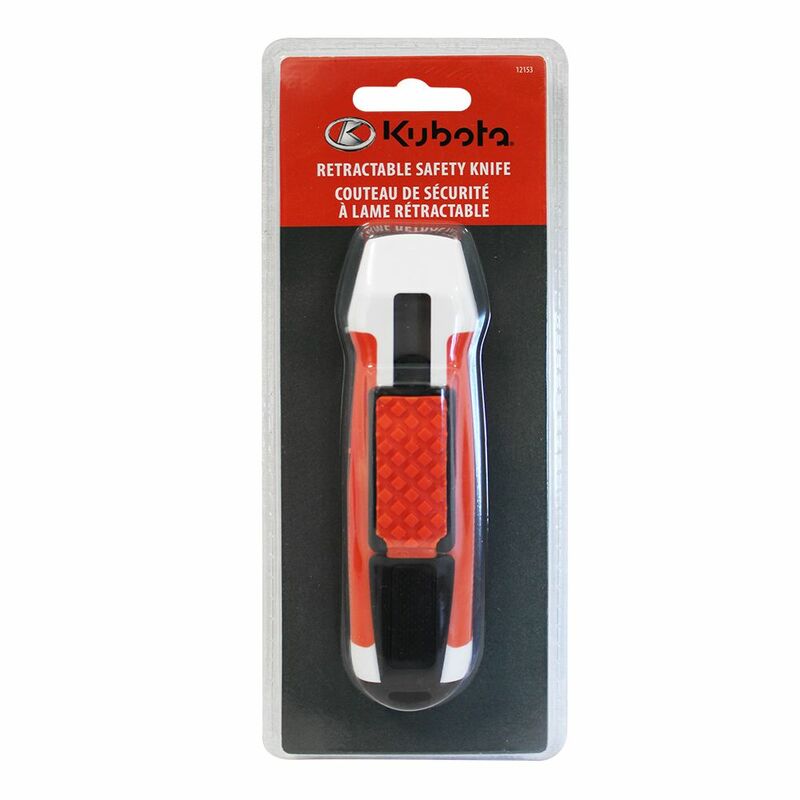 Retractable Safety Knife The Kubota Retractable Safety Knife is perfect for the home, office or shop. Designed with durable plastic, replaceable trapezoidal blade and anti-slip grip. Ideal box cutter for mailing, storage and moving.